Wrote this last week. Sorry I’m posting late. I’m just really busy. Enjoy. Here’s the thing with Pride and Prejudice and Zombies. It’s just not that good and when I say that, I mean that as a compliment if you can believe it. Some zombie movies are not meant to be analyzed and critiqued and documented like a medical examiner over a corpse. Some are meant to be torn apart with hacksaws and thrown in a receptacle labeled, “Danger: Hazardous Material” and thankfully so, considering some of the truly deprecating material that comes out of the film industry in the early months of every new year. Burr Steers, aside from having an intriguing name, is an unknown and will stay that way with his directorial style because, like it or not, he’s just not that good. This Jane Austen parody is far better than the film from 2005, at least in my eyes, but it’s not because of Steers’ ability to properly diagnose classic literature, his technique in panning the camera, choreographing stunts or developing imaginable characters. No, Steers’ asset is his own inadequacy. Steers is unable to attain any real cement in his mixing pot, anything excessively heavy that makes the popcorn bag feel a lot heavier. Instead, he just keeps spinning that wooden spoon. I may or may not be referencing a famous Adam Sandler film here. Moving on. No, what Steers does is make this liquid that I guess you could say is about as appetizing as getting an ice cream cone at McDonald’s for a dollar because let’s be honest, what you’re eating is probably not ice cream, both because you got it from McDonald’s and because it’s a dollar, which if that doesn’t raise your suspicion about what you’re putting in your mouth than I don’t know what will. Eventually, how low a price is shouldn’t comfort you anymore but disturb you, but I digress. Basically, Steers isn’t the guy you want doing the icing on your wedding cake. Where Steers belongs in the bakery, to keep the metaphor going, is in the batter mixing, because believe it or not ladies and gents, it’s actually incredibly difficult to make something with zombies excessively unappetizing. Throw some fair makeup and visual effects in there, give us a hero or heroine that is either somewhat admirable or scares the life out of us and you are going to find an audience that will pay money for that. It doesn’t have to be spellbinding, glossy or overly dramatic, although that is what the loyalists of the genre, such as myself, would prefer most days. However, when you’re as starved for a movie as I am in a series of what can only be described as after products of IBS, then your standards slowly start to sink like the ice cream off that cone the drive-thru employee is handing to you right as it spills all over the front of you in your car. In most circumstances, you’d be more than upset. In fact, you’d probably get on CNN for throwing a five-minute long hissy fit and giving that employee a dissertation on the non-importance of the fast food industry and the lack of a case the minimum wage movement has, but that day is not today. No, this time of year, a one-dollar cone of vanilla at McDonald’s is better than no ice cream and you’ll make due with that, because in January and early February, that’s how far gone you are already, New Year’s resolutions be damned. This zombie novella is lighthearted and rudimentary in its execution. If you’re expecting mind-blowing content out of this or anything made this early in the calendar year for that matter, you need to lower your standards. With that said, 2016 could have started a lot worse. The cast is likable and honest to the original material and the addition of zombies in Revolutionary War era England is a unique sight to behold. There’s no denouncing that. I’ve spent most of this review bashing this film but honestly, I enjoyed it. Critically, it’s not there and I’m certainly not going to recommend it, but if you’re desperate to see a moving picture that doesn’t make you want to run to the toilet and vomit, Pride and Prejudice and Zombies can be that film for you. 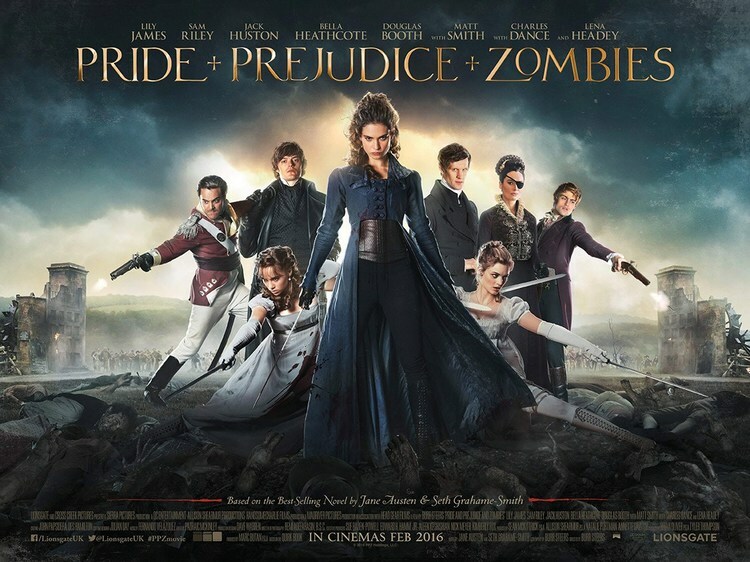 It’s not going to invoke a lot of emotion, there’s a specific plot point that makes no sense and will make you want to throw you hands up in the air and the conclusion feels too swift, but as an overall product, especially this early in 2016, Pride and Prejudice and Zombies leaves a positive impression. My score for Pride and Prejudice and Zombies: 67. All this mockery aside, Pride and Prejudice and Zombies is a popcorn film that you can watch with friends on a busy Friday night. You don’t have to pay attention during every minute of the thing, you can feel free to talk over points that you deem uninteresting and your experience won’t be any less than if you had watched every breathing second of it. If you’re looking for cheap entertainment and a laugh or two at the pure obnoxiousness of this whole charade, Pride and Prejudice and Zombies is your thing. At least until Deadpool comes out this week and we finally get the real treat of February.